Yay! I'm on my way to RootsTech today. I will be attending all of the general sessions (keynotes and entertainment events) which take place on a HUGE stage with 3 ginormous screens ... I share this because when I attended RootsTech the first time in 2012, I was blown away. 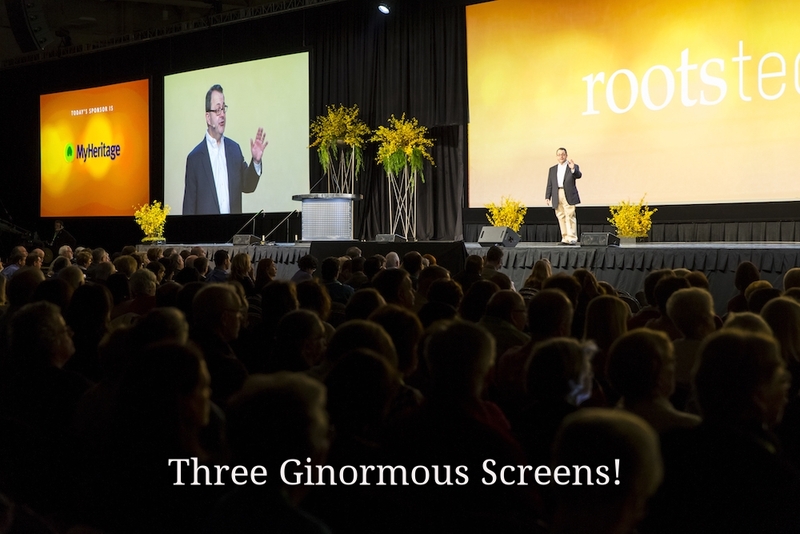 I had no idea how big this event would be ... but, back to my story, I will be up front and in person for all the general sessions, and eager to report on them, but please remember that these presentations will also be streamed live, beginning on Thursday morning, at rootstech.org. In other words, you can be there with me and the full schedule is HERE. I thought it might be fun to share my top ten list of the other sessions, from among the 300+ that I am planning on attending and invite YOU to tell me which 2 or 3 sound the most interesting to you. Tools and best practices for converting various storytelling mediums into a digital format that can be saved in the cloud and meta tagged for easy discoverability. Use sites such as Pinterest, History Pin and even Google Maps to share your family stories, find relevant content and information and make connections with other pinners. Studies have shown that knowledge about your family narrative strengthens relationships and creates a core identity that positively effects individual potential and family success. Learn how to use technology in your home to record and build on your family narrative. Project Life: Scrapbooking Has Never Been Easier! Join Becky Higgins to discover the ultimate solution to getting photos out of boxes and off your phone—and into completed albums for your family to enjoy. No scissors, no glue and no creativity required. Common questions and hurdles are: Where to start? What to include? What about sensitive issues? Learn a step-by-step method to make these decisions easier and the writing more fun. Interviewing is more than sitting down and asking a string of questions. It involves courtesy, respect and efficiency. Technology makes the interview easier than ever, but the interpersonal touch is still needed. Learn about this balance. Upload, post, and share. Watch for pitfalls of permissions, resolutions, and reuse. The session covers the ethics and safety of picture sharing, popular photo sharing platforms and citing your photos. See? I need your help!